The atmosphere is a layer of air (blended from a variety of gases) surrounding the earth many miles up in the sky. There is no clear boundary between the upper atmosphere and outer space. The atmosphere starts to be noticeable by spacecrafts re-entering the earth's atmosphere at a height of about 120 kilometres (75 miles). As the sun shines on the Earth, it is the atmosphere that lets the sunlight reach the ground and heat it up. It also prevents some of the heat from escaping back into space. 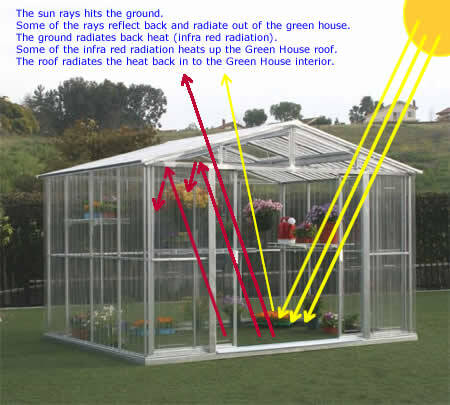 This is similar to our backyard greenhouse whereby the sunlight (mostly short wave radiation) penetrates through the glass upper atmosphere) and heats up the ground and plants. The heat (long wave radiation – infra red) finds it harder to escape through the glass (the upper atmosphere) and is partially trapped in the glass house keeping it warmer than the outside temperature. Since the infra red radiation is partially blocked from radiating to outer space, the upper atmosphere heats up and then radiates more heat down to the planet. Without the atmosphere, planet Earth would be cold and life would not be as we know it. Due to human’s activity on Earth from the beginning of the industrial revolution, the upper atmosphere now has a higher concentration of Greenhouse gases (primarily carbon dioxide). These gases do not let enough infra red radiation (heat) escape from the Earth’s surface to outer space. As those gases build up, the atmosphere continues to keep the excess heat from radiating into space. Over the last 100 years the average temperature has increased by 0.5 degrees Celsius. We named this trend – Global Warming. There are concerns that this continuing increase in temperature will affect our global climate. This may culminate in more severe floods and droughts, rising sea levels, an increasing population of insects and the earth's precipitation may be redistributed. This will drastically affect our social economic situation by reducing the general level of health as well as slowing down economic development. On the other hand, there are scientists who believe that the global warming we are currently experiencing is a natural phenomenon and is part of Earth's natural cycle. Currently it is difficult to prove which theory is correct but one thing is sure, we are producing greenhouse gases at extremely high rates; more than ever before. Only during the last few years have there been signs that the rate of greenhouse gases production has slowed. It seems that after the 1997 Kyoto Protocol, the world has at last taken the first step in reducing greenhouse gas emissions. The most important is carbon dioxide, also known as CO2. Carbon Dioxide is a colourless, odourless non-flammable gas. All humans and animals produce CO2 every time we exhale, but there is not much we can do about it. All plants recycle CO2 and converts it to oxygen by a process called Photosynthesis. The less plant life we have on our small planet the slower this process is, and the faster the excess CO2 is accumulated in our higher atmosphere. The main source of CO2 comes from the burning of fossil fuels - coal, oil, gasoline and wood. The second major greenhouse gas is Methane. Methane is a colorless, odorless, flammable gas created by rotting plants and garbage. Humans and other animals (i.e. cows and sheeps) also create methane every time we pass gas. Nitrogen oxide (N2O). It is acolourless greenhouse gas that has a sweet odour. It is produced by cars and by power plants burning coal as they generate electricity. Some major contributor to N2O are Fertilisers and cow / sheep Manure. One famous use for Nitrogen oxide is for anaesthetic by dentists (also called Laughing gas). Fluorocarbon is a general term for any group of synthetic organic compounds that contain fluorine and carbon. Many of these compounds, such as chlorofluorocarbons (CFC), can be easily converted from gas to liquid or liquid to gas. Because of these properties, CFC can be used in aerosol cans, refrigerators, and air conditioners. In the 1970’s, scientists proved that if CFC gases are released into the upper atmosphere they will break down the Ozone layer. Since then, in most western countries, the use of CFC's has been banned and a replacement was found – hydro fluorocarbons (HFC). HFC's are not affecting the Ozone layer but they still trap heat in the atmosphere and are considered a greenhouse gas. Ice is melting around the North and South Pole. 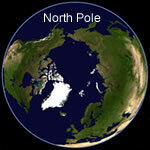 For the first time in the current recorded history, the North Pole has become an island. Pictures by NASA confirm that Arctic ice is melting at an unprecedented rate. 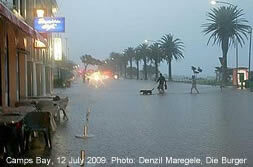 Sea levels will rise and areas near the sea shore could flood. 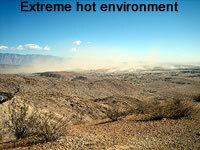 High Temperatures - inextreme heat could render areas unliveable. Some scientists now think that the average temperatures on Earth could rise by between 3 and 10 degrees Fahrenheit (1.6 to 5.5 Celsius) by the middle of this 21st century. As the temperature increases, hundreds of different species could become extinct, while many types of pests (such as rats and mosquitoes) could multiply in the warmer climate. Some gases are processed naturally by the Earth. Sea water absorbs carbon dioxide, as do the plankton in the sea. Plankton is more efficient in absorbing CO2 in colder water and due to increasing ocean temperatures, the plankton will be less efficient with this process. Plants and trees also soak up CO2, especially in the rainforest. As trees in the rainforests are being cut down continuously, there are fewer trees to soak up the CO2 from our atmosphere. 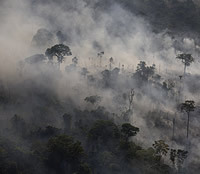 It is not enough that we are reducing our planet's natural air filter, but we are also creating more greenhouses gases (CO2) by burning these trees. The fact is that one of the greatest contributors to the Greenhouse Effect is the burning rainforests. Energy is one of the major culprits in the buildup of greenhouse gases. If we can reduce our consumption of energy, we will not have to rely on the energy produced by power plants. Lower production of of energy will reduce gas emissions. Any contribution to this saving is worthwhile! Please visit our Hints and Ideas page with a long list of opportunities to improve our planet situation and it may also save you money. You can have your say and also correct, update or add to the above details by sending your comments using our Leave a Comment page. Carbon dioxide (chemical formula: CO2) is a chemical compound composed of two oxygen atoms covalently bonded to a single carbon atom. It is in gas form at current Earth's atmosphere standard temperature and pressure. Photosynthesis is a process that converts carbon dioxide into organic compounds using energy from the sunlight. One of the main compounds created are sugars. Photosynthesis occurs in plants, algae, and many species of Bacteria, but not in Archaea. Photosynthetic organisms are called photoautotrophs. Photoautotroph is a name given to organisms which are able to produce their own food. In plants, algae and cyanobacteria photosynthesis uses carbon dioxide and water, releasing oxygen as a waste product. Photosynthesis is vital for life on Earth. Plankton consist of any drifting organisms (animals, plants, archaea, or bacteria) that inhabit the pelagic zone of oceans, seas, or bodies of fresh water. Plankton are defined by their ecological niche rather than their phylogenetic or taxonomic classification. They provide a crucial source of food to more familiar aquatic organisms such as fish. One of the plankton groups that relates to this article is Phytoplankton (from the Greek word phyton, or plant). Phytoplankton is an autotrophic, prokaryotic or eukaryotic algae that live near the water surface where there is sufficient light to support photosynthesis. Among the more important groups are the diatoms, cyanobacteria, dinoflagellates and coccolithophores.